BittWare, the leader in Altera-based FPGA COTS boards, announced today that Polybus has integrated their QDR Infiniband IP cores onto BittWare’s Stratix V FPGA PCIe hardware. Polybus Systems Corp. provides both QDR Infiniband Link Layer cores as well as QDR Infiniband Target Channel Adapter cores. Both cores have been proven and validated on BittWare’s family of Stratix V FPGA PCIe boards. 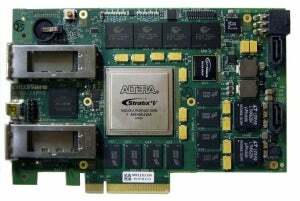 "BittWare is the industry leader in Altera Stratix FPGA COTS boards," said Josh Rosen, President at Polybus. "Working with them to ensure that our Infiniband IP cores would run on their Stratix V-based PCIe boards was great for us. The quality of their boards and the engineering talent behind their products made the process easy and efficient. We’re very pleased that BittWare is the first Stratix V COTS vendor to support the Polybus Infiniband IP cores." "Infiniband is heavily used in the world of high-performance computing, providing high throughput, low latency communications," stated Ron Huizen, VP of Technology at BittWare. "We are happy to have partnered with Polybus to provide their Infiniband IP cores on our proven, fully-validated Stratix V PCIe COTS platforms. The dual QSFP+ on each board allows two Infiniband QDR links, giving our customers a tremendous amount of bandwidth." The S5PH-Q PCIe COTS board and QDR Infiniband core have been adopted by the High Performance Computing Division’s Systems Integration Group at Los Alamos National Laboratory in a project funded by the Department of Defense. BittWare’s S5PH-Q and S5PE boards are both available today with the QDR Infiniband cores from Polybus. Contact Sarsen Technology for more details.